Rain and fierce winds are hitting parts of the UK, as what could be winter's worst storm moves in from the Atlantic. Winds of almost 80 mph (130km/h) had brought down trees and power lines in south-west England, where several roads are now blocked. Severe flood warnings have been issued for the Devon and Cornwall coast. Near Newport, south Wales, 170 people had to evacuate a caravan park overnight. Meanwhile, forecasters say central Scotland could see blizzards. The storm, which forecasters have been predicting for several days, has already left considerable damage and disruption in its wake. The storm may have reached its peak in the South West but further damaging gusts were expected along the coast on Monday evening. 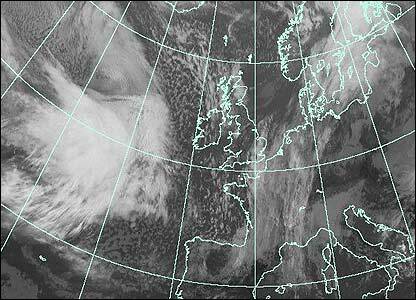 Houses in west Wales are reported to have had their roofs blown off overnight. The storm is expected to cause travel disruption in other parts of the UK, with winds already reaching 42mph at Heathrow. Winds of 63mph have hit the east coast of Northern Ireland, with 49mph winds in Crosby, Merseyside, and 46mph in Birmingham. The Met Office warns rail delays are likely, with the worst weather expected to strike on Monday afternoon. Some rail services have already been cancelled. Gale force winds were expected to combine with spring high tides to raise water levels along the coast by up to 1.5m over normal levels. The storm tearing through the UK today threatens widespread damage, especially in South Wales and southern England, with winds expected to gust up to around 130km/h (80mph) in exposed coastal areas. An added danger is the threat of spring tides, which are especially high at this time of year in the run-up to the spring equinox. It could produce a large Severn Bore, expected around 8:30am today. 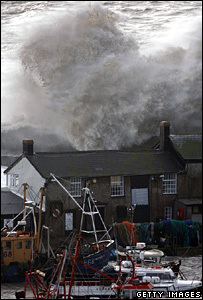 The bore is Britain’s most spectacular natural phenomenon – a tidal wave that rushes in from the sea up the River Severn for up to around 32km (20 miles). The Severn estuary has some of the highest tides in the world, and they are especially high around the equinoxes.